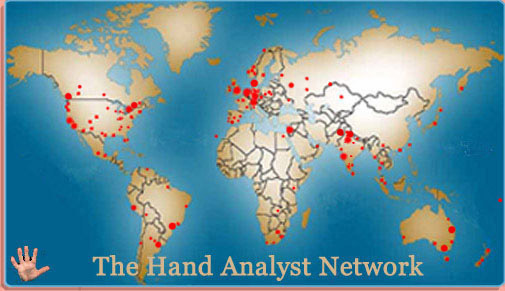 The Global Palm Reading Network! 750 hand reading experts from 54 countries are now included! The Palm Reading Network in... the UNITED KINGDOM! "The Global Palm Reading Network!" Re: The Global Palm Reading Network! 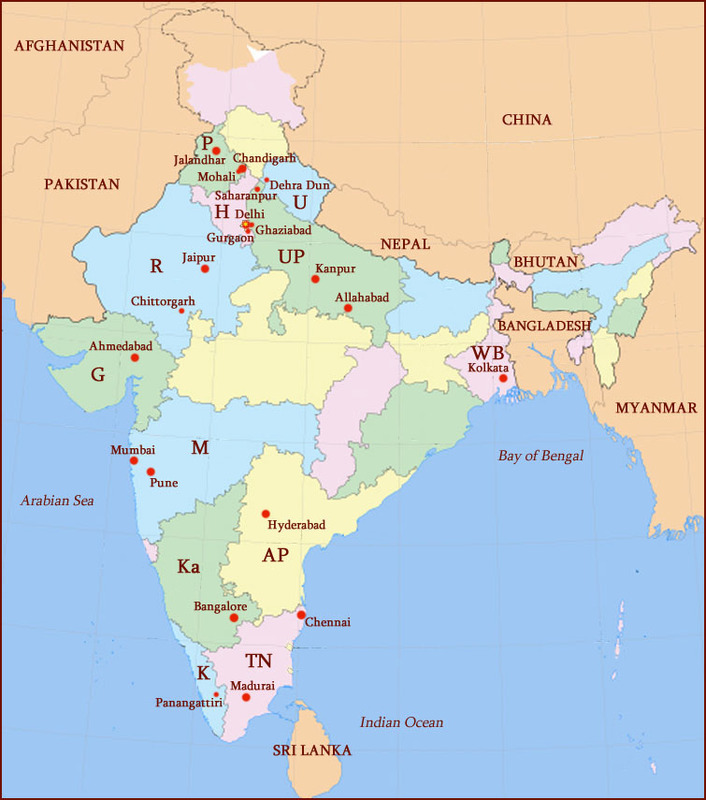 Find a palmist / palm reader from 13 states in the 'Kingdom' of classic palmistry... India! How can one travel abroad to study the hands? Of course, one can individually travel abroad to study hands. But I am not sure what you exactly have in mind with your question... please explain. Hi eglenn3, welcome to the forum. there are readers all over the world. If you search their websites, you can find teachers in many countries. Some do intensive courses eg I think Johnny Fincham (a teacher from UK) has one next month in France. Of course there are plenty of teachers within your own country of USA too. Do you have a particular country in mind where you would like to travel to learn palmistry? I see. Yes I was thinking that there was a sort of official study that one could do. Studying with a professional is ideal. So is it mostly self taught? eglenn3 wrote: I see. Yes I was thinking that there was a sort of official study that one could do. Studying with a professional is ideal. So is it mostly self taught? Yes, there are no 'offical' studies available... though probably all available institutes in the world will claim that their services belong to the very best available (unfortunately there are very little objective standards available in this field). So, my advice for you will vary from person to person: depending on your residence / country, plus: interest & background. But so far you haven't provided any specification yet suitable to make a specified recommendation. I'm interested in chiromancy. I'd like to be able to read the hands as a means to help people with problems. I want to learn this while living outside the US. I wanted to know of learning opportunities abroad. Learning the arts as an assistant. eglenn3 wrote: I'm interested in chiromancy. I'd like to be able to read the hands as a means to help people with problems. I want to learn this while living outside the US. I wanted to know of learning opportunities abroad. Learning the arts as an assistant. Sorry, your specifications are too general for me to answer. In general, in this field usually only 'master students' can become an assistent (with a paid job). IIHA Hand Analyst Danielle Tonossi from Crawford Bay, BC, Canada has joined the Global Palm Reading Network. How to join "'Global Palm Reading Network"? dhundhun wrote: How to join "'Global Palm Reading Network"? That opportunity is only available for those who are active in the field of hand reading by using their genuine/authentic identity. If you are still interested, please inform my about your real name via the PM system, only then I can proceed to consider further action. Does this (Global Palm Reading Network) forum is open for US Residents or US Citizens? Any US Residents or US Citizens? dhundhun wrote: Does this (Global Palm Reading Network) forum is open for US Residents or US Citizens? Sorry dhundhun, I am not sure that I understood your initial request correctly - because your latest question signals that you might have an incorrect perception about what this topic 'The Global Palm Reading Network' is about. This topic does not have a direct connection with this forum, it is only available here: http://www.handresearch.com/directory.htm (and there are plenty US residents/citizens listed). So, please specify what you exactly have in mind regarding your initial question.